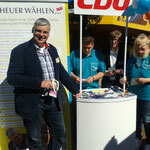 Drei Wochen Zugabe - Stichwahl ist am 15. 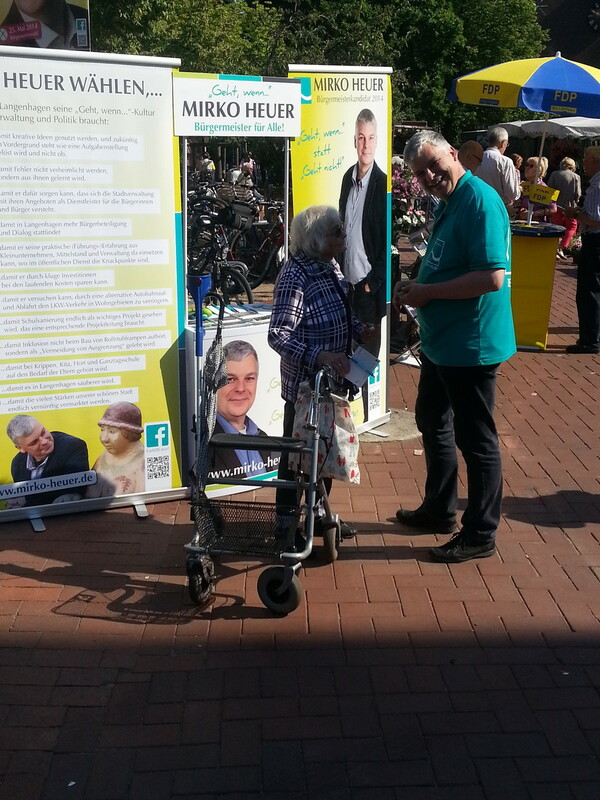 Juni 2014. Die Zeit bis zu diesem Termin nutzen wir für die Mobilisierung der Wähler. Nicht allen ist jetzt schon klar, dass die Bürgermeisterwahlen noch nicht gelaufen sind. 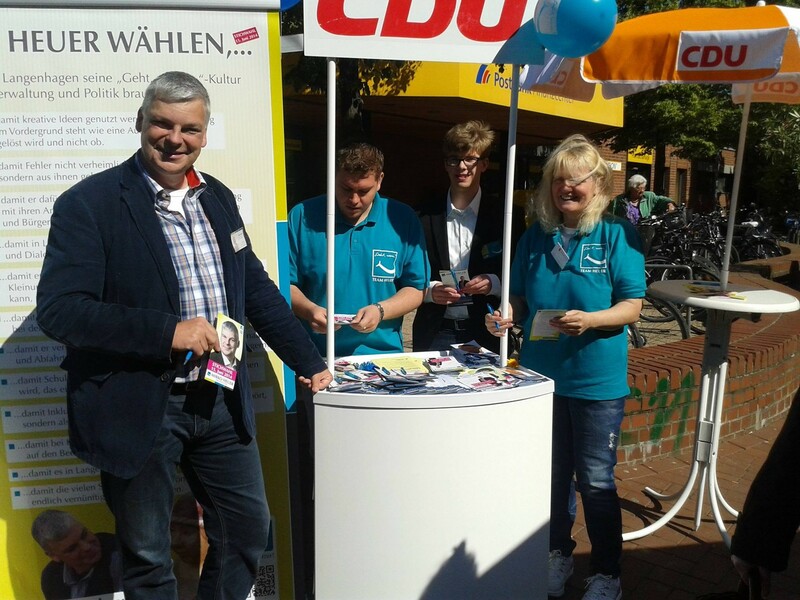 Dabei hat es in Langenhagen ja eigentlich gar keine Änderung gegenüber der letzten Wahl des Bürgermeisters/ der Bürgermeisterin gegeben. Zwar entfiel zwischenzeitlich die Stichwahl, aber pünktlich zu den Neuwahlen hat die aktuelle Landesregierung die Stichwahl wieder eingeführt. Da keiner der fünf Kandidaten, die sich zur Wahl gestellt haben, über 50 Prozent der Stimmen auf sich vereinigen konnte, kommt es nun am 15. Juni zu einer Entscheidung zwischen den beiden Kandidaten, die die meisten Stimmen erhalten haben. 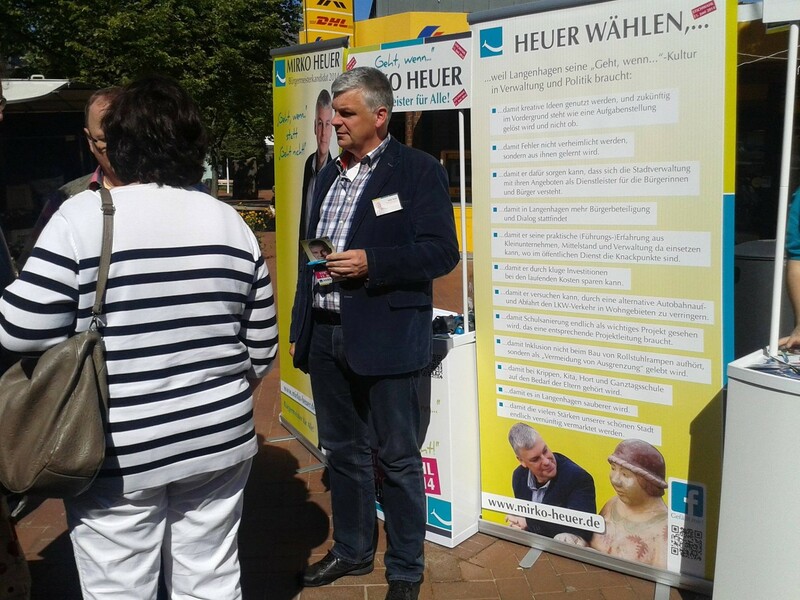 Die Zeit bis zur Stichwahl nutzen wir für Infostände in der Kernstadt und in den Ortschaften und natürlich führen wir auch unsere Hausbesuche im Rahmen der Geht-Wenn-Tour weiter fort. Dabei kümmern wir uns natürlich vorrangig um die Bereiche, in denen wir bisher noch nicht vorstellig geworden sind. Thanks for the good writeup. It actually used to be a entertainment account it. Look complex to more delivered agreeable from you! However, how could we be in contact? Hello, Neat post. There is an issue together with your web site in internet explorer, might test this? IE nonetheless is the market leader and a large element of other folks will pass over your excellent writing due to this problem. Great site you have here but I was wondering if you knew of any community forums that cover the same topics discussed here? I'd really like to be a part of group where I can get responses from other knowledgeable individuals that share the same interest. If you have any recommendations, please let me know. Thanks! We absolutely love your blog and find a lot of your post's to be just what I'm looking for. Do you offer guest writers to write content available for you? I wouldn't mind publishing a post or elaborating on a few of the subjects you write regarding here. Again, awesome website! Every weekend i used to go to see this web page, as i wish for enjoyment, since this this website conations genuinely good funny data too. This article offers clear idea in favor of the new visitors of blogging, that genuinely how to do blogging and site-building. Woah! I'm really digging the template/theme of this blog. It's simple, yet effective. A lot of times it's very hard to get that "perfect balance" between user friendliness and appearance. I must say you've done a amazing job with this. In addition, the blog loads super quick for me on Chrome. Outstanding Blog! What's up, the whole thing is going fine here and ofcourse every one is sharing information, that's truly good, keep up writing. Excellent items from you, man. I've be mindful your stuff prior to and you're simply too fantastic. I really like what you've obtained right here, really like what you're stating and the way through which you assert it. You make it entertaining and you continue to care for to stay it wise. I cant wait to read far more from you. That is actually a terrific web site.